Nomadic was designed as a tender for Titanic and her sister ships. About a quarter of the size of Titanic, she incorporated much of the technology and luxury of the famous ocean liner. Now, after an extensive restoration, she is a museum ship in Belfast and is the only surviving vessel to have served with the White Star Line. In order to attract more passengers, transatlantic liners sailing between Southampton in New York would often make a call in Cherbourgh, France. These calls allowed passengers who were traveling to and from continental Europe to join the ships without having to take a ferry across the English Channel. When White Star Line conceived of the Olympic class (Olympic, Titanic and Britannic), it realized that these ships would be too large to dock in Cherbourg. Therefore, it commissioned the building of two tenders that would ferry passengers and mail between the ships anchored offshore and the port of Cherbourg. The Nomadic would serve first and second class passengers while the Traffic would handle third class passengers and cargo. (Traffic was sunk during World War II). 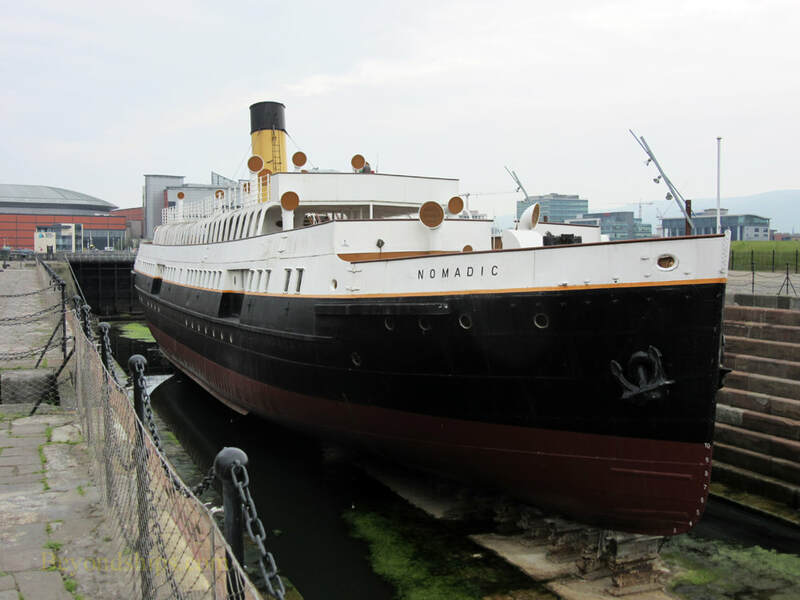 Nomadic was begun in 1910 in slipway number 1 at the Harland & Wolff shipyard in Belfast. While Nomadic was under construction, Olympic and Titanic were being built in the neighboring slipways. 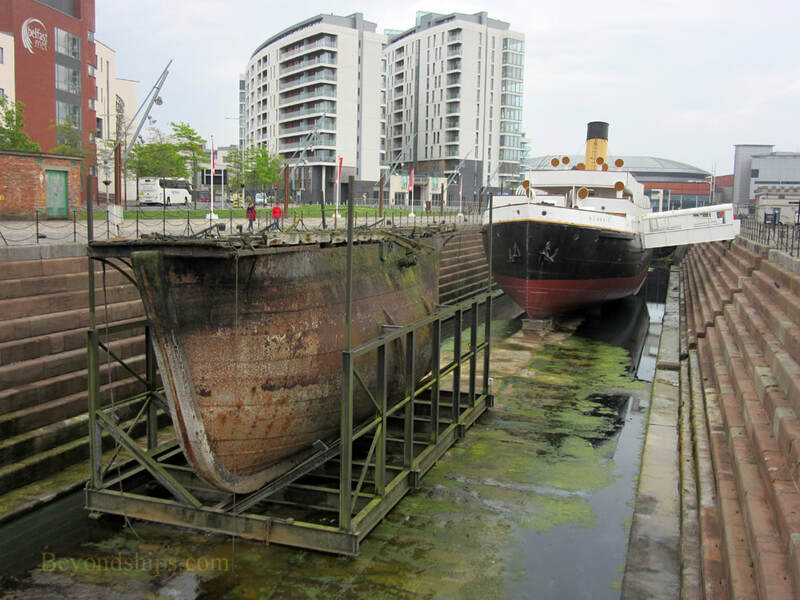 The two tenders were handed over to the White Star Line on 27 May 1911 and accompanied, a towing and salvage firm. Olympic on her sea trials before sailing to their home port of Cherbourg. On 10 April 1912, Nomadic transferred 274 passengers out to Titanic including J. Bruce Ismay, the head of the White Star Line, multi-millionaire Benjamin Guggenheim, and the socialite Molly Brown. Following the Titanic disaster, Nomadic continued to ferry passengers to Olympi and other White Star ships calling at Cherbourg. Nomadic was requisitioned in 1917 by the French government. During World War I she served as a troopship, a patrol craft and a minesweeper. She returned to private control and her role as a Cherbourg tender in 1919. However, in 1933, Cherbourg opened a deep water berth rendering tenders unnecessary. White Star, now merged with Cunard, sold Nomadic to the Société Cherbourgeoise de Sauvetage et de Remorquage, a towing and salvage firm. But Nomadic continued to act as a tender serving ships that elected not to dock. In 1940, Nomadic participated in the evacuation of troops from Cherbourg in front of the advancing German army. Moving to Portsmouth, England, she continued her Second World War service ferrying troops, laying mines and acting as a patrol vessel. The war severely damaged Cherbourg and it took a long time for the port to recover. Therefore, Nomadic was brought back to Cherbourg after the war and resumed her role as a tender transferring passengers between the port and ships offshore. Among the ships that Nomadic served were the Queen Mary and the Queen Elizabeth. Among Nomadic's passengers in this period were film legends Charlie Chaplin, Elizabeth Taylor and Richard Burton. With the transatlantic ocean liner era coming to an end, Nomadic was sold in 1969. After another change in ownership, Nomadic began a new career as a floating restaurant in 1977, moored on the River Seine near the Eiffel Tower in Paris. She continued in this role for 22 years until health and safety regulations rendered the business nonviable. In 2002, Nomadic was seized by French authorities and towed to Le Harve. In order to pass under some Seine bridges, part of Nomadic's superstructure was removed. The ship was subsequently put up for sale. Fearing that she would be scrapped, several maritime organizations commenced a campaign to raise the money to purchase Nomadic. The campaign failed to reach the amount needed but generated such interest that the public sector decided to become involved. Nomadic was purchased by the Northern Ireland Department for Social Development in 2006. Nomadic was then taken back to Belfast. In 2009, she was taken to the Hamilton Graving Dock on Queens Island, which is believed to be where Nomadic was originally fitted out. In 2011, Harland & Wolff, re-created Nomadic's bridge and other superstructure elements that had been removed during her time as a restaurant. Further restoration work was done, often by volunteers. LINE: White Star Line and subsequently various other entities and individuals. Above: A stern view of Nomadic. ​Below: In front of Nomadic in the Hamilton Graving Dock is a caisson. Made of wrought iron, it acted as a gate to the graving dock. After being placed across the dock, it would be filled with water and would sink down thereby blocking the entrance. To open the dock, the water would be pumped out of the caisson after which it would float like a boat. 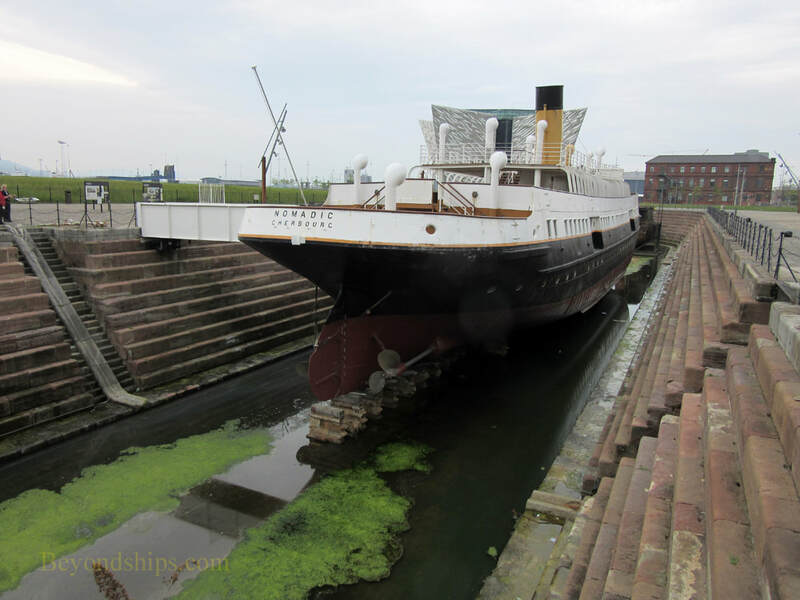 Nomadic is now owned by the Titanic Foundation, which also owns the nearby Titanic museum. Like the museum, Nomadic is operated by Titanic Belfast. In addition to being of interest as a vintage ship, Nomadic is of interest because it is the only part of the Titanic project to have survived intact. Visitors can see the nautical technology of that time as it was employed. In addition, the interior of the ship has been restored so that you can see what was considered luxury in its day. Three decks are open to view. The top deck includes the bridge, which was open to the weather, the funnel and the intakes used to bring air to the decks below. The two interior decks are divided with first class facility in the forward half and second class facilities aft. In addition, the crew quarters have been re-created on the lower deck.